Dominic David Rene Smith (born June 15, 1995) is an American professional baseball first baseman for New York Mets of Major League Baseball (MLB). He was selected by the Mets with the 11th overall pick of the 2013 MLB draft out of Junípero Serra High School in Gardena, California, and made his MLB debut in 2017. He bats and throws left-handed. His nickname of Medium Hurt comes from a play of fellow first baseman Hall of Famer Frank Thomas whose nickname is Big Hurt. Smith participated in Reviving Baseball in Inner Cities and the Major League Baseball Urban Youth Academy in his youth. He attended Junípero Serra High School in Gardena, California, and played for the school's baseball team as a first baseman, outfielder, and pitcher. He led the Cavaliers to the California Interscholastic Federation Southern Section division championship in 2013. Smith committed to attend the University of Southern California (USC). The Mets selected Smith in the first round, with the eleventh overall selection, of the 2013 Major League Baseball draft. Rather than attend USC, he signed with the Mets for a $2.6 million signing bonus. The Mets assigned Smith to the Gulf Coast Mets of the Rookie-level Gulf Coast League (GCL), where he batted .287 with three home runs and 22 runs batted in (RBIs) in 48 games. He was subsequently promoted to the Kingsport Mets of the Rookie-level Appalachian League, where he recorded four doubles in six at bats. At season's end, Baseball America named Smith as the 4th best prospect in the GCL for 2013. He spent the entire 2014 season with the Savannah Sand Gnats of the Class A South Atlantic League. With just one home run, 44 RBIs and 77 strikeouts in 461 at bats, Smith fell way short of expectations. Smith got off to slow start with the St. Lucie Mets of the Class A-Advanced Florida State League (FSL) in 2015. He batted .143 with one double in his first sixteen games, and was 0-for-22 to start May. On May 12, Smith got his first extra base hit since Opening Day with a double against the Tampa Yankees. The 3-for-5 performance signaled a turn around for Smith, who compiled a sixteen-game hitting streak to raise his batting average to .260. For the month of June, Smith batted .352 with a FSL-leading 38 hits and 51 total bases. He also had the second most RBIs (20) and fifth most runs scored (15) to earn FSL Player of the Month honors. The hot hitting continued; Smith ended the season with a .305/.354/.417 slashline, and a career high six home runs. He led the league with 79 RBIs and 33 doubles on his way to being named FSL Player of the Year. After the season, he played for the Salt River Rafters of the Arizona Fall League. In 2016, Smith played for the Binghamton Mets of the Class AA Eastern League, where he posted a .302 batting average with 14 home runs and 91 RBIs. He played in the 2016 All-Star Futures Game. The Mets assigned Smith to the Las Vegas 51s of the Class AAA Pacific Coast League to start the 2017 season. The Mets promoted Smith to the major leagues on August 11, 2017 after Fernando Salas was designated for assignment. He made his debut that night against the Philadelphia Phillies at Citizens Bank Park, recording a single for his first off of Nick Pivetta. Smith hit his first home run off of Sonny Gray on August 15. He ended the 2017 season with a .198 batting average and nine home runs in 167 at bats for the Mets. 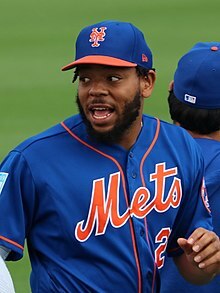 In spring training in 2018, Smith was set to compete with Adrián González to be the Mets' starting first baseman, but he missed most of spring training due to a quadriceps injury. He began the season in Las Vegas, and was promoted on May 11 when Jay Bruce went on the paternity list and demoted when Bruce returned on May 14. Smith was promoted again on June 11 when the Mets released Adrián González. Smith was demoted again on July 20 after Yoenis Céspedes was activated from the disabled list. During spring training in 2019, Smith resumed using a continuous positive airway pressure machine. Smith had been diagnosed with sleep apnea in 2016 when, during a sleep study, he stopped breathing 90 times per hour—a doctor told him that 30 breathing stoppages per hour would have been considered a severe case. He and Mets general manager Brodie Van Wagenen credited the treatment with making him more alert and productive on the field that spring. Smith's parents, Clay Smith and Yvette LaFleur, have seven children total. They lived separately while raising Dominic. His mother works in child care and his father is a dog trainer and groomer. ^ Mark Newman (June 6, 2013). "Smith, Crawford products of MLB's youth initiatives". MLB.com. ^ Guild, Ron (May 31, 2013). "Wilson, Smith Lead Serra to First CIF Baseball Title". Wavenewspapers.com. Archived from the original on June 20, 2013. Retrieved June 6, 2013. ^ Eric Sondheimer (May 31, 2013). "Dominic Smith Leads Gardena Serra to Division 3 Baseball Title". Los Angeles Times. Retrieved June 6, 2013. ^ Spencer Fordin (May 6, 2013). "Urban Youth Academy's Impact on Draft Continues". MLB.com. Retrieved June 6, 2013. ^ Jim Halley (May 29, 2013). "Serra's Dominic Smith Uses a Glove for More than Batting". USA Today. ^ Anthony DiComo (June 6, 2013). "Mets Stick with M.O., Draft High School Bat Smith". MLB.com. ^ a b Witz, Billy (July 9, 2013). "A New Life for the Mets Prospect Dominic Smith". The New York Times. Retrieved August 11, 2017. ^ Ben Badler (September 24, 2013). "Gulf Coast League Top 20 Prospects With Scouting Reports". Baseball America. The Enthusiast Network. ^ Mike Newman (2014). "Dominic Smith Scouting Report". ROTOscouting. ^ Cody Derespina (June 23, 2015). "Dominic Smith fares well against Jose Fernandez in Mets' minors". Newsday. ^ Steve Sypa (July 8, 2015). "Mets prospect Dominic Smith named Florida State League Player of the Month". Vox Media, Inc.
^ "Minor league baseball: Miracle's Jeff Smith, Alex Swim receive Florida State League All-Star honors". Naples Daily News. Journal Media Group. September 3, 2015. ^ Josh Norris (October 15, 2015). "Mets' Smith Willing to Trade Power for Balance". Baseball America. ^ Rubin, Adam (May 18, 2016). "Farm Report: Dominic Smith beginning to flash power with Binghamton". ESPN.com. Retrieved July 11, 2016. ^ Guardado, Maria (June 28, 2016). "Mets prospects Dominic Smith, Dilson Herrera tapped for 2016 All-Star Futures Game". NJ.com. NJ Advance Media. Retrieved July 11, 2016. ^ Lennon, David (July 10, 2016). "Dominic Smith hopes to be a part of Mets' future plans". Newsday. Retrieved July 11, 2016. ^ Heneghan, Kelsie (March 30, 2017). "Mets reassign Smith to play for 51s: New York sends No. 2 prospect to Las Vegas for start of 2017 season". MiLB.com. Retrieved March 31, 2017. ^ Clark, Matt (August 11, 2017). "Mets Promote No. 2 Prospect Dominic Smith". CBS New York. Retrieved August 11, 2017. ^ Rubin, Adam (August 12, 2017). "Brothers reunited: Smith, Rosario both record career firsts in Philly". SportsNet New York. Retrieved August 12, 2017. ^ Puma, Mike (August 16, 2017). "Dominic Smith resisted temptation for first homer". New York Post. Retrieved July 20, 2018. ^ Davidoff, Ken (February 7, 2018). "Inside Dominic Smith's transformation, which is for real". New York Post. Retrieved July 20, 2018. ^ Healey, Tim (May 11, 2018). "Jason Vargas to be skipped in Mets' rotation". Newsday. Retrieved July 20, 2018. ^ Puma, Mike (May 15, 2018). "Asdrubal Cabrera is thriving at a position he never wanted to play". New York Post. Retrieved July 20, 2018. ^ Healey, Tim (June 11, 2018). "Mets release Adrian Gonzalez". Newsday. Retrieved July 20, 2018. ^ Braziller, Zach (July 20, 2018). "Yoenis Cespedes' return comes at Dom Smith's expense". New York Post. Retrieved July 20, 2018. ^ Armstrong, Kevin (March 18, 2019). "Dominic Smith, the Mets' Sleeper at First Base". New York Times. Retrieved March 20, 2019. Wikimedia Commons has media related to Dominic Smith.